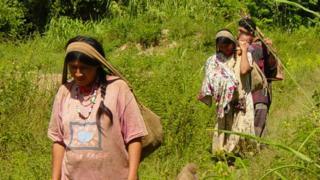 The healthiest hearts in the world have been found in the Tsimane people in the forests of Bolivia, say researchers. Barely any Tsimane had signs of clogged up arteries - even well into old age - a study in the Lancet showed. "It's an incredible population" with radically different diets and ways of living, said the researchers. They admit the rest of the world cannot revert to a hunter-gathering and early farming existence, but said there were lessons for all of us. There are around 16,000 Tsimane who hunt, fish and farm on the Maniqui River in the Amazon rainforest in the Bolivian lowlands. Their way of life has similarities to human civilisation thousands of years ago. It took the team of scientists and doctors multiple flights and a canoe journey to get there. How does your diet compare with the Tsimane? They are also far more physically active with the men averaging 17,000 steps a day and the women 16,000. Even the over-60s have a step count over 15,000. It makes most people's struggle to get near 10,000 seem deeply insignificant. "They achieve a remarkable dose of exercise," says Dr Gregory Thomas, one of the researchers and from Long Beach Memorial medical centre in California. So how magnificent are their hearts? The scientists looked for coronary artery calcium or "CAC" - which is a sign of clogged up blood vessels and risk of a heart attack. The scientists scanned 705 people's hearts in a CT scanner after teaming up with a research group scanning mummified bodies. At the age of 45, almost no Tsimane had CAC in their arteries while 25% of Americans do. By the time they reach age 75, two-thirds of Tsimane are CAC-free compared with the overwhelming majority of Americans (80%) having signs of CAC. The researchers have been studying this group for a long time so it is not simply a case of the unhealthy Tsimane dying young. Michael Gurven, a professor of anthropology at University of California, Santa Barbara, told the BBC: "It is much lower than in every other population where data exists. "The closest were Japanese women, but it's still a different ballpark altogether." Is it only diet and exercise? They also smoke a lot less, but they do get more infections which could potentially increase the risk of heart problems by causing inflammation in the body. One idea is that intestinal worms - which dampen immune reactions - could be more common and this may help protect the heart. Prof Gurven said: "I would say we need a more holistic approach to physical exercise rather than just at the weekend. Dr Thomas said: "It could be to maintain health we need to be exercising much more than we do. "The modern world is keeping us alive, but urbanisation and the specialisation of the labour force could be new risk factors [for an unhealthy heart]. "They also live in small communities, life is very social and they maintain a positive outlook." What do experts make of all this? Dr Gavin Sandercock, reader in clinical physiology (cardiology) at the University of Essex, said: "This is an excellent study with unique findings. "The Tsimane get 72% of their energy from carbohydrates. "The fact that they have the best indicators of cardiovascular health ever reported is the exact opposite to many recent suggestions that carbohydrates are unhealthy." Prof Naveed Sattar, from the University of Glasgow, said: "This is a beautiful real life study which reaffirms all we understand about preventing heart disease. "Simply put, eating a healthy diet very low in saturated fat and full of unprocessed products, not smoking and being active life long, is associated with the lowest risk of having furring up of blood vessels."